In this tutorial, you will learn about map-based navigation in ROS. You will be able to develop a ROS program in C++ and Python that will allow you to define goal locations for the robot and then send these goal locations to the navigation stack to execute the mission and head towards the goal. Note that it is possible to do so with rviz, but in this tutorial, you will be able to do this programmatically. You will also learn how to configure ros stage simulation to use a map of your choice and perform a navigation mission in the select map. Understand how map-based navigation is performed in ROS. Use sound_play ROS package to play sound in a ROS application. Later on, as an exercise, you will use your own map to develop a navigation mission for your Turtlebot. 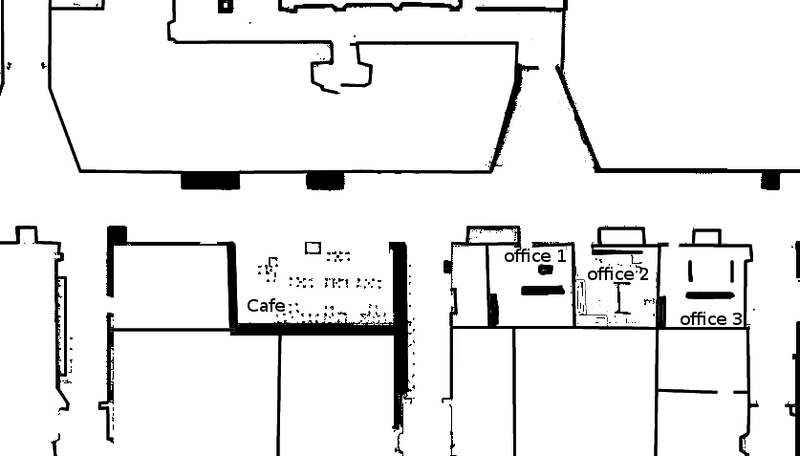 In the map of Figure 1, we identify four locations of interests namely, the Cafe area, Office1, Office2 and Office3. Other locations can also be defined, but we just used these representative four locations for illustration purposes. If we want to develop a ROS program that allow the robot to navigate to those locations, we first need to know what are the (x,y) coordinate of these locations onto the map. This is what will be explained later. Then, we use these coordinates to define a navigation mission that we submit to the robot’s navigation stack to execute it. Remember that any robot on ROS runs the move_base navigation stack which allow the robot to find a path towards a goal and execute the path following while avoiding obstacles. Refer to Navigation Stack Review for a refresher. You can find the whole cpp and python files in our GitHub repository. They are located in src/turtlebot/navigation/map_navigation folder. In particular, we will use the launch file map_navigation_psu.launch that contains all the needed ROS nodes for this tutorial. Here is the content of the map_navigation_psu.launch file. You can observe that this launch files defines the map_file, that is the yaml file that defines the map that will be used by the navigation stack, and displayed by rviz. In addition, it defines the world_file that is world file that defines also a map used by the stage simulator. Furthermore, initial_pose_x and initial_pose_y define the initial location of the robot in terms of x-coordinate and y-coordinate respectively. How to determine this initale location and locations of interest will be described in details in the next section of this tutorial. the third node, is optional, and represent the sound_play node that allow to make sound notification in a ROS program. The following video demonstrates the whole process. The program structure is very simple. The user is requested to press a key, and based on his selection, the defined method moveToGoal(x,y) will be executed, where x and y define the coordinates of the locations of interest. Lines 13-20 define the location of points of interest that we determined in the last section Finding the Coordinates for Locations of Interest. Then, from lines 42-51, if the goal is successully reached, the program will display congratulations text message and will plan a ship_bell sound. Otherwise, it will display hard luck message and will play the short buzzer sound. Now, let us focus more on how the method moveToGoal(x,y) is implemented. Here is the code. Line 4 defines a client that is responsible for sending navigation goal request to the move_base server. In fact, the navigation stack of ROS has a MoveBaseAction action server that receives navigation goals request, and then finds a global path from the robot location to the goal location through the Global Path Planner, and once a path is found, it executes the path while avoiding obstacle through the Local Path Planner until it reaches the destination or fails to do so for any reason (like unexpected obstacle found on path). Lines 7-8 will wait until it finds the action server and will not proceed longer until it makes sure that it is alive and will receive navigation requests. This is in fact a blocking instruction. Line 11 defines a goal location and lines 13-25 specify the parameters of that location. It is easy to understand that lines 19-25 define the coordinates for the goal location. In particular the orientation component values expressed in quaternion refers to a heading equal to zero degrees. Lines 14-15 are extremely important, in particular line 14. Line 14 goal.target_pose.header.frame_id = "map" specifies the reference frame for that location. In this example, it is specified as the map frame, which simply means that the coordinates will be considered in the global reference frame related to the map itself. In other words, it is the absolute position on the map. In case where the reference frame is set with respect to the robot, namely goal.target_pose.header.frame_id = "base_link" (like in this tutorial), the coordinate will have a completely other meaning. In fact, in this case the coordinate will represent the (x,y) coordinate with respect to robot base frame attached to the robot, so it is a relative position rather than a absolute position as in the case of using the map frame. goal.target_pose.header.frame_id = "base_link"; //or "base_footprint"
In this case, goal location refers to the position that is one meter ahead of the robot (in front of the robot), so by executing this goal location, the robot will just move 1 meter in straight line. This is because the goal location is one meter in the x-axis (that is the front of the robot) with respect to the base_link frame attached to the robot. Line 15 adds a timestamp to the goal location. Line 28 sends the goal location request to the move_base action server, and wait for its execution as shown in line 31 (ac.waitForResult()). Note that this request is sychrounous, which means it will block until the result is sent back to the requesting client object. After it finishes, we can check if the goal succeded or failed and output a message to the user accordingly. To add some animation to this example, we used the ROS package sound_play which allows to play sound files. Observe that we included the C library for the sound plan in line 4 of the first code above. Furthermore, to be able to play sounds, it is necessary to start the ROS node, which was already done in the map_navigation_psu.launch. Without this node, no sound can be played. In the program, we create a sound client with sound_play::SoundClient sc; and also we defined the absolute path to sound files with path_to_sounds = "/home/ros/catkin_ws/src/gaitech_edu/src/sounds/". Then, we use the method sc.playWave(path_to_the_sound_file) to play a certain sound file. For example, in case of successul mission, the sound is played with sc.playWave(path_to_sounds+"ship_bell.wav");. 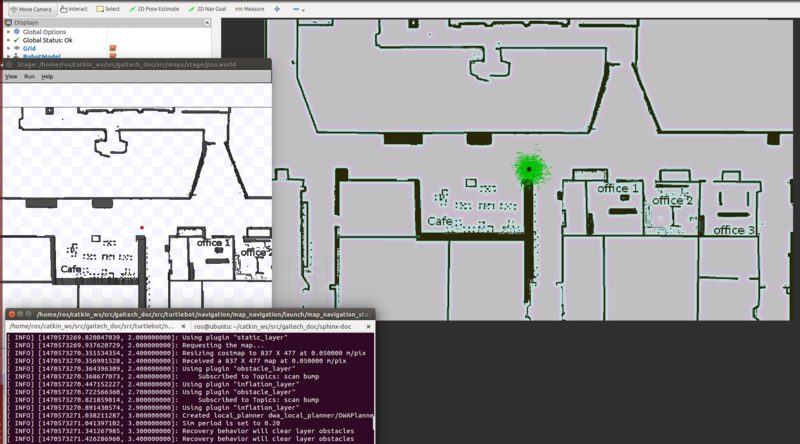 Then, on the terminal command, you enter the location of your choice based on the selection menu and observe how the robot navigates to the goal location. Congratulation! You now know how to program navigation mission for your simulated Turtlebot. It is easy to apply the navigation code on a real robot. However, you should deploy it using the map of the environment where you are going to run the experiments. 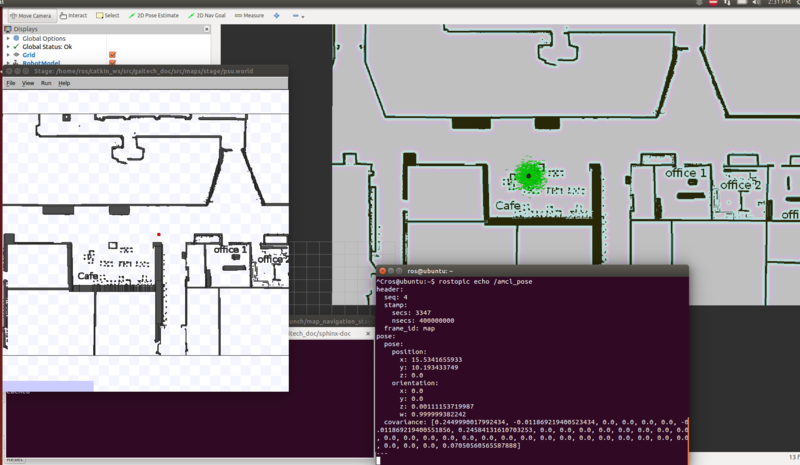 First, using the instructions of the Building a Map with a Turtlebot tutorial, create the map of your experimental environment. Step 1. Put the .yaml and .pgm map files in the src/maps/ folder. Let us assume they are called mymap.yaml and myamap.pgm. Step 2. In the src/turtlebot/navigation/map_navigation/launch/ folder, make a copy of the two files map_navigation_stage_psu.launch and turtlebot_stage_psu.launch and give them other names, for example map_navigation_maymap.launch and turtlebot_stage_mymap.launch. We will use these two files to launch the simulator with your own map. Step 5. Now, you need to edit the file mymap.world file. This file is used by stage to display the map. In the folder, src/maps/stage/, Make a copy of psu.world, change its name to mymap.world and open it with gedit. First, change `psu and psu.pgm in Lines 4 and 5 as shown. Line 4 assigns a name to the floor plan, and Line 5 refer to the map itself, in our case mymap.pgm. Finding the size is important. The size can be determined from two information from the yaml file, namely, the resolution and the pixel width and the pixel length. For example, in case of psu.yaml file, we have a resolution = 0.05 and from the pgm file, the image of the map has (837*477) (pixels^2). Multiplying by the resolution, we get the size of the map as (41.85 * 23.85) m^2. So,in the case of psu map, width_map = 41.85 m and length_map=23.85 m.
For the width and length offsets, we generally set them to the half of the width and length respectively, in this case will be (20.925, 11.925). Then you set the initial position of the robot of your choice. For this, you can choose any position that would not conflict with an obstacle. In case of psu, we set the initial position to the center of the map (20.925, 11.925) as a choice. Other choices would also work. Now, you should be able to run the simulator with your own map. In the latter case, You must make sure to have correctly configured your network settings as explained in the Network Configuration tutorial. Question 1. What is the ROS topic that is used to find the location of the robot? Question 3. Consider the following yaml for a map. Given that my_map.pgm has the size 540x680 pixels, what is the size in meters for the environment?